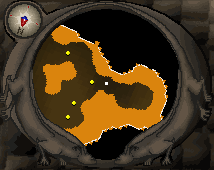 Lava maze dungeon is a small dungeon near underneath the lava maze in the wilderness. Unlike the maze itself, the dungeon is not accessible by free players; only members can go down the ladders. The dungeon is separated into two sections separated by a river of lava (two ladders going down). 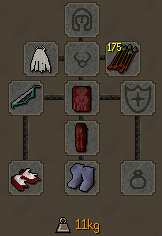 One side has a lever to go to the King Black Dragon (KBD) and is often used by pkers. The other side has a few interesting things too such as a rune rock and a couple Black Dragons. That section is not frequented much. This section of the dungeon, is the biggest. 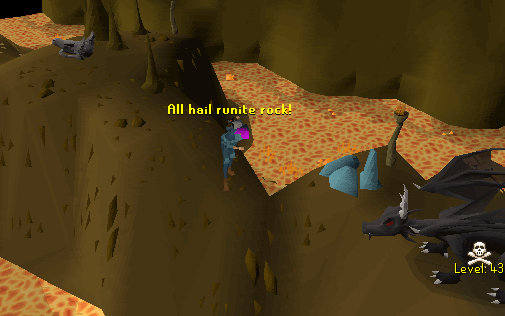 It contains a rune rock, some greater demons and a few black dragons! 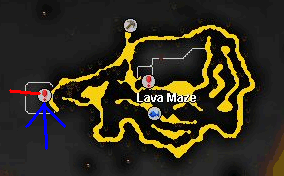 However, you will have to run past Black Knights, Scorpions, Hill Giants and Lesser Demons through the lava maze to get there! 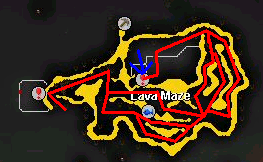 You have just entered the Lava Maze dungeon! All around you is orange-hot lava bubbling away. The lava is just like water; you can't walk in it. You're going to have to stay on land... There aren't any monsters yet so there's nothing to worry about. These guys are pretty scary: they're huge. 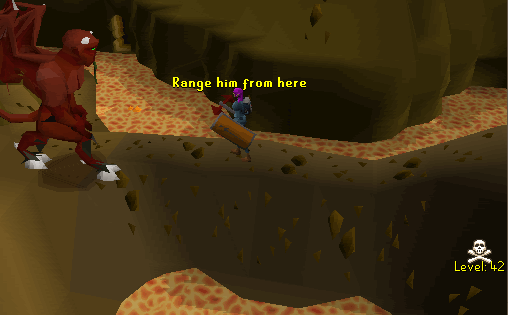 They're level 92 and the place isn't multi-combat so people can train here if they want. Just watch out for other people there. It is also possible to fight them with a halberd or range them with a bow and arrows. Look at the pictures below to see how to do it. Watch out though because sometimes they can get through the little passage and attack you. If this happens just run back to the ladder and wait till he goes back to his usual spot. Watch out for these guys, because they poison quite badly. They come after the greater demons so if you are fighting them, then you won't encounter them. However, if you are going against the black dragons, you will have to run through them. This part of the dungeon has a lot more visitors than the other part, even though it is a lot smaller than the other section. All it has is 5 spiders and a lever! To get to this to the ladder, you have to open a gate, and run a past 4 lesser demons. The second entrance of the dungeon is situated here. You will arrive in the middle of 4 of those spiders and they will attack you momentarily. 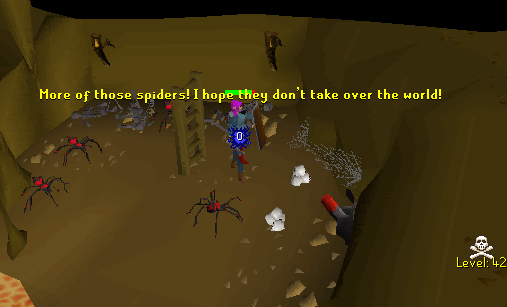 Once you go down the ladder, get to the lever as quick as possible so that you don't get attacked by the spiders. The lever is placed just south of the ladder on the wall. 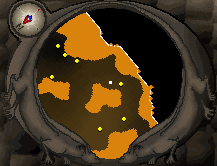 Thousands of players pull this lever to go the King Black Dragon's Lair. You will have to adjust the screen to pull the lever, and you cannot pull it at the same time as other players. 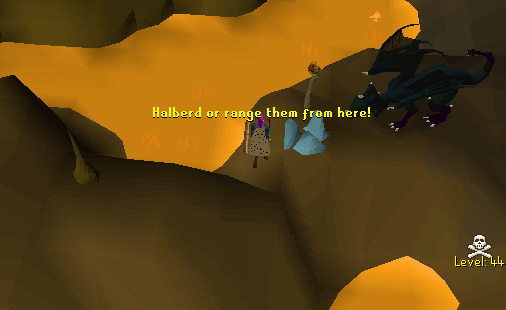 Beware, because as soon as you pull it, you enter the lair of the King Black Dragon (KBD). 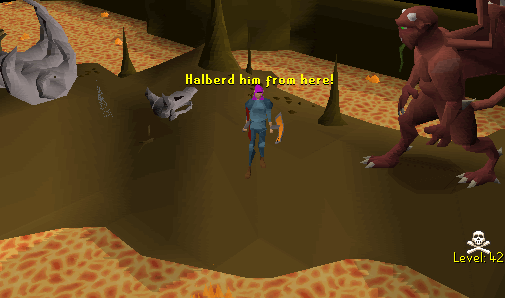 In there, not only is there the dreaded level 276 King Black Dragon, but pkers, so watch your step! 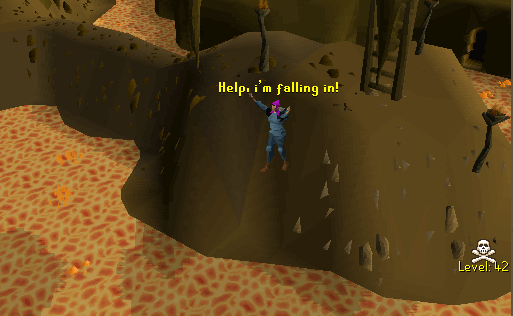 The lava maze dungeon isn't the best place to train but there aren't many others so it's not bad. The only way to train in there is fighting. Read on to find out what you should wear. Firstly, you will need to be a high level to train here. 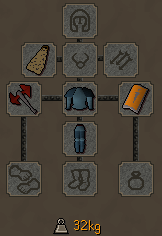 Good armor (rune or better) is required so that you do not lose too much health. 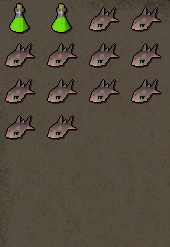 A good weapon is also required in case a PKer arrives. Try to wear 3 items. I suggest wearing weapon, legs and body. If you are going to fight the dragons, then you must bring a anti-dragon shield. 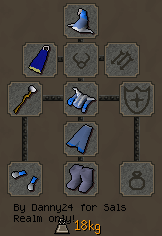 You may want to bring boots of lightness and/or spotted or spottier cape to be able to run longer. 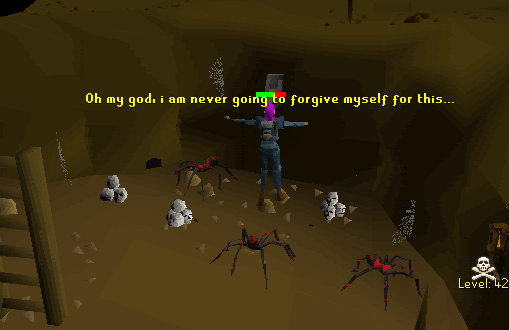 Do not bring teleportation item is required since you cannot teleport after level 20 wilderness. Pretty much the same as melee except for the armor. Just wear your best dragon-hide and a good bow. Again, same as the others but with your best mage armor (mystic, infinity etc.) and bring a staff (your choice again). 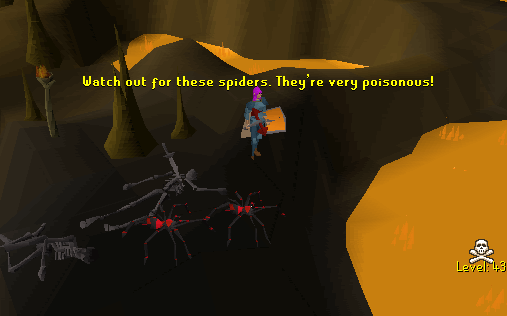 A compulsory thing is anti-poison potions, since the spiders can poison you very easily and quite badly. Obviously, bringing lots of food is required (tuna or better is good), just fill up the rest of your inventory will do. Finally, if you are a Mage, then you will need runes to fight the monsters.